December | 2012 | ARChive of Contemporary Music, or "Would You Take My Mind Out for a Walk"
Did you clean 4,500 LPs covered in talcum powder? Did you work during Hurricane Sandy searching for albums by flashlight? Did you wade through a mile long alley of engine parts and motors, piled 4 ft high, in 96 degree weather, to find a Beatles 78? Did you unload 150,000 recordings? And if you can, please send a donation so we can continue this important, and sometimes preposterous work of preserving the world’s music. So please Donate via paypal (button below), on our nycharities.org page (best for matching funds). It’s tax deductible, and for as as little as $50 you can become a member, shop early at our sale and attend two swell parties. And let us know if you have recordings to donate to help build the collection. B.+ Fred + Quinn and the 47 volunteers and interns who made it all happen in 2012. Here’s some vinyl X-mas magic available at our Holiday sale – ends this Sunday, so do stop by. Lookit how cute, and cuddly and fuzzy and Christmasy our sale is! There’s also copies of Punk Magazine from the 70s to give the Holidays an edge, and tons of music books that make swell gifts. This year’s winter Members Only Party, a preview and a shindig held on the Thursday evening before the semi-annual Record and CD Sale kicks into full swing, was a very soulful event. Frank Lipsius, whose father founded Jamie and Guyden Records in Philadelphia during the fifties, planned to have a celebration in honor of the release of COOLER THAN ICE: THE ARCTIC RECORDS STORY; a box set containing 6 CDs and 6 seven-inch records representing the complete singles output of Arctic Records, another Philadelphia record label, this one specializing in soul music and run by the radio DJ Jimmy Bishop during the sixties, but owned and distributed by Jamie/Guyden. Arctic’s biggest hit was “Yes I’m Ready” by Barbara Mason; a Number 5 smash during the summer of 1965. Also, Arctic was the launching pad for several star-destined artists, including Darryl Hall (Hall & Oates), who was a member of The Temptones; The Trammps (“Disco Inferno”), which included members of The Volcanos; and Kenny Gamble, who wrote songs and issued a couple singles on Arctic. Although he had no release on Arctic, John Ellison (the lead singer/songwriter for The Soul Brothers Six) stole the show when he sang his most famous song, “Some Kind of Wonderful.” Do not confuse this with The Drifters’s song (written by Carole King/Gerry Goffin) of the same title. The Soul Brothers Six song, released on Atlantic Records, barely scraped the bottom of the Top 100 in 1967. However, it was covered by Grand Funk Railroad in 1974 and was the Number 3 song in the land the following year. The song has since been covered by the likes of Buddy Guy and Huey Lewis & the News. After five singles for Atlantic, Ellison and The Soul Brothers Six recorded for Phil-L.A. of Soul, another record label owned by the good people at Jamie/Guyden, which makes Ellison part of the family. At the ARChive Members Only Party, Ellison looked striking, dressed in a long, white Nehru jacket. Whereas the other acts sang along to tracks–karaoke style–Ellison sang a capella, with just handclaps and the many people in the room who knew the song singing back-up, making for a very memorable performance. It was a tremendous performance by a great artist! How will the ARChive top this at its Members Only Record & CD Sale Preview Party this summer? Become a member and find out in June!!! Of course you can join now and get an end-of-the-year tax write off, and help support the ARChive. This single by Lora Logic (Rough Trade, UK, 1981) is just one of the great vintage (?) Punk singles recently hung on the wall @ the ARChive Holiday Record and CD Sale in Tribeca, Goes everyday, 11-6, until Dec 16th. Do drop by. Say Hi! Hot Item @ Our Cool Sale – Starts Sat! Well the sale at the library starts tomorrow, with bargains like this early LP by author Maya Angelou, for $5! Today’s the Fifth, so here’s some $5 LPs for Sale! Any of the above – $5 each. East Coast – West Coast, all around the towns! No New York is $25, and the San Fran 415 Records release is less, the left coast is ALWAYS less than NY, @ $5. 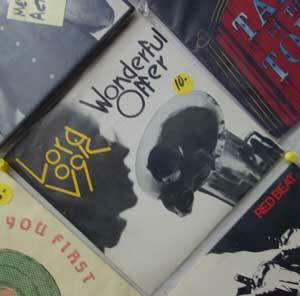 Yes, great classic Punk Era travelog vinyl at the ARC sale this year. Here’s some of the regional and International compilations we will be offering this Holiday sale. Most of these right out of the box they were packed in from the late 1980 + early 1990s and never played.